We have all heard ‘it’. “Honest Officer, I did not see that motorcycle coming”. And though we get tired of hearing that excuse, what can we do as riders, short of having a fireworks display equal to that of the 4th of July coming out of our helmets, to improve our visibility to cagers everywhere? 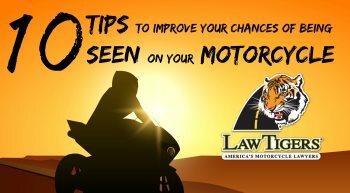 A major cause of motorcycle crashes is the failure of other drivers to see the motorcyclist, especially in heavy traffic or at night. Regardless of fault, the fact is that the motorcyclist is the one whois more likely to be injured. We can’t control the actions of others but we can take certain steps to increase our odds of being seen. Use reflective tape: If Black is your ‘thing’ and you are going to don it from head to toe then you need to inspire the MacGyver in you and use reflective tape as your top accessory. Put it on everything. Avoid riding a black motorcycle: No I don’t hate black, it’s just not the best color to ride if visibility is a factor. The brighter the color the more visible the bike. Weave when coming to a stop: Do a slight weave within your lane when stopping at an intersection. By doing a little weave your headlight becomes an unusual moving object and hopefully alert drivers to your presence. It also helps catch the attention of the traffic behind. Use hand signals: In addition to the turn signals of the bike, you should also use those hand signals you learned to inform other vehicles about your direction intent. Tap Tap Tap: Tap your brake to activate the brake light: Taping the brake when slowing down really helps increase your visibility to the traffic behind you. It’s also good to tap when you feel someone may be following you too closely. Always be aware of your position: Try not to ride adjacent to cars. Try to ride in the front line of vision of the driver behind you, not in their peripheral vision. Always be aware of where you are in regards to their blind spots. Be ready to react if a driver starts moving into your lane and I cannot stress this enough: always be on the lookout for escape lanes. Escape lanes: When you are stopped at an intersection do you automatically look to see if you will pull away left or right if the car coming up behind you doesn’t stop in time? Always be on the lookout for a way out. Leave plenty of space: Leaving a buffer between your motorcycle and the vehicle ahead of you allows you time to react to obstacles and helps prevent the vehicle in front of you from blocking oncoming traffic’s view of you.